Sunset over the Great Plains is often a vibrant experience of color and contrast. Often it inspires poetry, short stories, discriptive essays, or other prose, for an author. For the artist in me, it always inspires a painting. 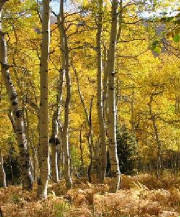 Just out my back door and up the road a piece, stands a grove of Aspen trees that appeal to my greater sense of nature. I love walking through the Aspen in the spring as their colors come to life, pale green among the deep rich tones of the evergreen trees, and white against the dark bark of winter. I sense a wealth of history in the mountains... if only the Aspen tree could speak. In Autumn color fills the air, a rich tone of gold that speaks of wealth and wonder. This road inspired a life of painting. The beauty of a country road disappearing into colorful trees may actually not mean much to the average person. Many would not want to travel that road. When I first saw it, as a child, I was inspired by the fact that it went 'nowhere'. The destination hidden by trees inspired me to pain this road, write about it, and eventually to follow it.